And here are Part 4 and 5, with the Top 10 and… something else. Welcome to the five+1 part SP6! It’s finally time for the Top 10! From now on, since we’ll have more time for each song, we’ll present them in a “one chorus” format (from the beginning of the song to the end of the first chorus), and use PV’s made by third parties at times. These were #10 to #4! #10 was Happy Synthesizer. What a fitting a title for this refreshing techno-pop song that stimulates our spirits and bodies! A lot of odotte mita (dance) videos of this song have been uploaded. Also, the Top 10 has changed for the most part compared to the last Special. Until now, videos used to go down slowly from one Special to the other, but it’s the first time there have been so many changes. Now it’s true that the SP5 and the SP6 are different, in that, due to special circumstances, the former dealt with one year worth of data whereas the latter covers only half a year, so that may be part of it. But still, so many changes! Everyone, now there’s only Part 5 left for this Special. We’ll see the Top 3, with the glorious #1. Oh, I’m just so excited! Are you ready? … there’s nothing else before that, right? So let’s jump to Part 5, the finale! Whee! I can hear people say “come on, Naho…” It’s time for our regular segment, the Adults’ VocaRan. Alright, I got it, I’ll do it! The Adults’ VocaRan is for songs that would normally enter the Weekly VocaRan, but that were excluded because of adult content. What is “adult content”? Well, I think you’ll understand when you’ll see the videos. Everytime there are lots of great videos that enliven the ranking; I wonder what will #1 be? Well then, let’s see #10 to #1 in one go! Of course, the videos have been edited so that good children can watch the ranking. Thank you for your understanding. Well then, let’s really jump to Part 5 now! It’s time for the exciting Top 3! Whee! Welcome to the five+1 part SP6! It’s finally time for the Part 5, the last one! Only three songs left! But before that… please refrain from posting comments like “I know what #1 is!” or “it gotta be…” before the actual announcement. That was #3, “Panda Hero”. It seems its magic is still working! Originally, this song was called “OFFICIAL ORANGE” and was featured in his doujin album of the same name. It has been re-arranged, and a PV was made: that’s the video we’ve just seen. It got a lot of attention from fans because of the revised melody. #3 was a fresh new song; I wonder what #2 will be? That was #2, “Mozaik role”. It got higher than in the SP5! The structure of this song, a “mosaic” formed by the opposition of black and white underlying both the lyrics and the PV, intrigued and appealed to many fans. “Matryoshka” was the number 1 of the VOCALOID Ranking SP6 – VOCALOID’s Dawn”! As you’ve probably noticed, all the Top 3 songs featured Gumi. “What a landslide for her!”… as some of you would say, but let’s think about it deeper. DECO*27, whose song “Mozaik Role” was #2, and who gave us an interview for our special project, composed Kou Shibasaki’s single “Mukei Spirit” (NAYUTAWAVE RECORDS); he’s very active. There’s also Hachi, whose songs “Matryoshka” and “Panda Hero” made it into #1 and 3 respectively, who has a unique style and who’s very popular. But then, they’re not alone, a lot of other composers who ranked high in this Special have a charm of their own, thanks to which they got popular. The popularity of Vocaloid will soon stop being only about using Miku or Gumi for instance; it’s becoming much more complex, it’s the combination of different factors. We’ve spoken with many people for the special project, and a lot of them talked about how what appealed to them wasn’t simply the characters: they mentioned the composers’ personal styles, diversity, expression, etc. The events we attended, Vom@s and VocaFes are doujin conventions. Think about it: they’re “places where you can meet directly with the creators”. Maybe we would’ve got different answers in live events like Miku’s 39’s Giving Day. But still, what we can learn from the SP6 is that it’s not really about different characters, and how they compete with each other; rather, it seems reasonable to come to the conclusion that more people who listen to Vocaloid music on a neutral stance have joined the fandom. 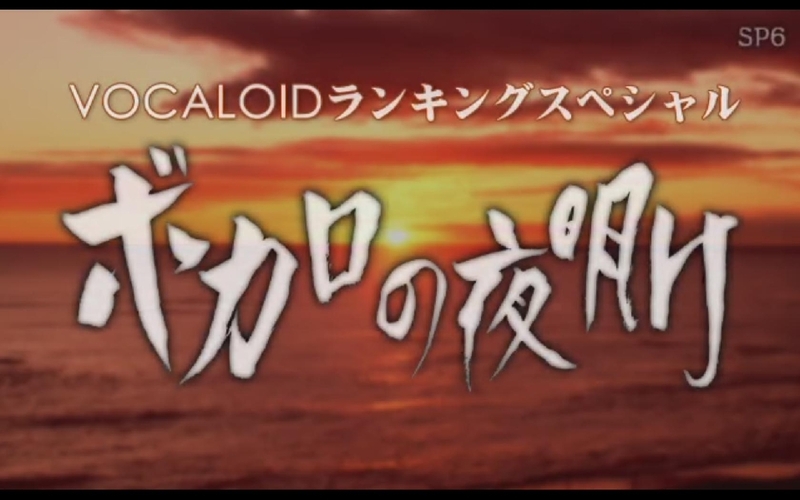 And this is “Vocaloid’s Dawn”. That was the “Vocaloid Ranking SP6 – Vocaloid’s Dawn”! Thanks to all of you for watching! We’ll now present songs up to #1000 to end this ranking. For #1001 and below, please check the uploader’s comment. All ranking makers and Vocaloid-related site administrators. And… all Vocaloid users and listeners! The Vocaloid movement gave birth to many things. They all have something in common: human relationships. All these people share the same passions and have great times with each other; they bond. This announces the coming of Vocaloid’s dawn. Again, I wish to express my deepest sympathy for those who suffered from the Great East Japan Earthquake. The data collection for this SP6 was over on March 9, but due to the disaster that struck just before I could upload it, it was delayed for nearly two months. I started preparing this Special last year, gathering material for the project during two months, so I’m really glad I managed to upload it eventually. It will take some more time, but I think I’ll soon be able to resume the VocaRan. I hope you’ll continue following the Weekly Vocaloid Ranking. Ahh, so glad that Shinkai shoujo did it to the top10, that's certainly my favorite. Now Hachi… I tried to hear again Panda Hero and I'm really not getting it. Wow. GUMI sure has gotten popular. She needs her own concert. Len on the other hand… it seems like his popularity is (sadly) decreasing. NONE of Wowaka's songs made into to the top 3!? What is this!? GUMI in top 3, Hachi dominates 2 and DECO*27 takes one. Even though this was kinda predicatable, it's interesting. Sippotan, you are in our thoughts & prayers along with the rest of Japan's survivors. You provide a service that helps me connect with my Autistic daughter who loves the songs created with Vocaloid software. We watch your rankings together each week. Thank you and I hope everything works out well for you!